It was February of 2009 when Mike Klopmeyer was given the responsibility of proposing a way to organize the perennials business for Ball Horticultural Company. As a company, Ball had been involved in perennials breeding for many years. However, a more formal structure was needed. Over the course of a few months (and some back-and-forth), it was determined inspiration for this new business’ name would be pulled from a recently purchased company – Darwin Plants in Hillegom, The Netherlands – and the idea of Darwin Perennials was established. The company's first product development manager was Dr. Brian Corr, who was responsible for perennial seed and vegetative product development. 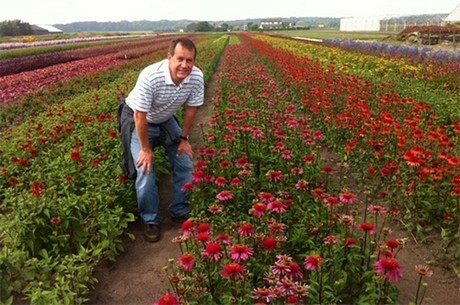 After he left to pursue other opportunities in June of 2009, it was decided that seed-raised perennials would be developed through the Kieft Seed division, and vegetative perennials would be Darwin Perennials’ wheelhouse. That decision created the current position that Global Product Manager Karl Batschke has filled since September of 2009. Karl: "A lot has changed in the past 10 years. A decade of growth and lots of coloring the world! We have licensees throughout the world representing our genetics. Our accomplishments at the Darwin Colombia farm continue to set the bar for excellence, and Darwin Perennials is a recognized leader in the development and sales of great perennial plants. There is so much to be thankful for – and look forward to – as we celebrate our 10th anniversary! Thank you for being a part of our story."